Raspberry tart flavors in a buttery bar. 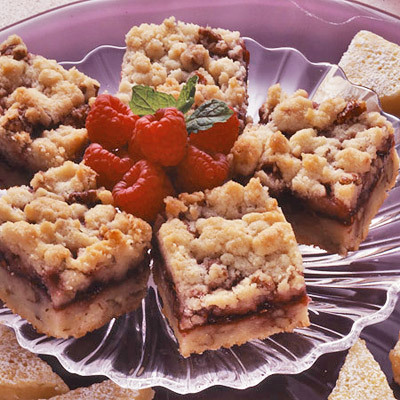 It takes very little time and only a few ingredients to make these rich buttery raspberry-filled bars. Heat oven to 350°F. Combine all crumb mixture ingredients in large bowl. Beat at low speed, scraping bowl often, until mixture resembles coarse crumbs. Reserve 2 cups crumb mixture; set aside. Press remaining crumb mixture on bottom of greased 8-inch square baking pan. Spread preserves to within 1/2 inch of edge. Crumble reserved crumb mixture over preserves. Bake for 40 to 50 minutes or until lightly browned. Cool completely; cut into bars.